Why do people visualize data? People visualize data either to consume or produce information relevant to a domain-specific problem or interest. Visualization design and evaluation involves a mapping between domain problems or interests and appropriate visual encoding and interaction techniques. This mapping translates a domain-specific situation into abstract visualization tasks, which allows for succinct descriptions of tasks and task sequences in terms of why data is visualized, what dependencies a task might have in terms of input and output, and how the task is supported in terms of visual encoding and interaction idioms. Describing tasks in this way facilitates the comparison and cross-pollination of visualization idioms across application domains; the mapping also applies in reverse, whenever visualization researchers aim to contextualize novel visualization techniques. In this dissertation, we present multiple instances of visualization task abstraction, each integrating our proposed typology of abstract visualization tasks. We apply this typology as an analysis tool in an interview study of individuals who visualize dimensionally reduced data in different application domains, in a post-deployment field study evaluation of a visual analysis tool in the domain of investigative journalism, and in a visualization design study in the domain of energy management. In the interview study, we draw upon and demonstrate the descriptive power of our typology to classify five task sequences relating to visualizing dimensionally reduced data. This classification is intended to inform the design of new tools and techniques for visualizing this form of data. In the field study, we draw upon and demonstrate the descriptive and evaluative power of our typology to evaluate Overview, a visualization tool for investigating large text document collections. After analyzing its adoption by investigative journalists, we characterize two abstract tasks relating to document mining and present seven lessons relating to the design of visualization tools for document data. In the design study, we demonstrate the descriptive, evaluative, and generative power of our typology and identify matches and mismatches between visualization idioms and three abstract tasks relating to time series data. Finally, we reflect upon the impact of our task typology. Dr. Matthew Brehmer (@mattbrehmer) is an alumni of the InfoVis and Multimodal User Experience groups at the University of British Columbia, advised by Tamara Munzner. Matthew holds an M.Sc in Computer Science (Specialization in Human-Computer Interaction) from the University of British Columbia (2011), and a B.Computing (Honours) in Cognitive Science from Queen's University (2009). He defended his dissertation on March 23rd, 2016. 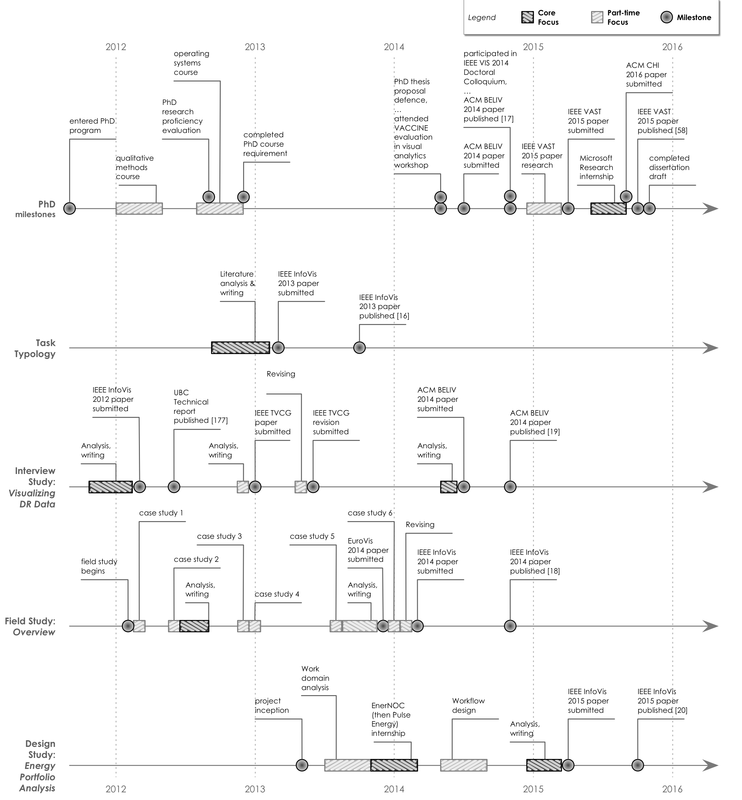 This diagram depicts the chronology of the projects described in this dissertation. Click to view a larger version of the diagram in a new tab.